It is plausible that the world has warmed very slightly – but in any one location, if we count the number of unusually cold events, anomalous snowfalls, and the like, and compare with the number of unusually warm events, we are just as likely to get more cold events and less warm events in recent times than the converse. To detect global warming, you have to average over the entire world, and it is unclear and debateable how to make an apples to apples average over the entire world. It is plausible that there has been a bit of warming over the past few decades for reasonable ways of doing the averaging. But polar bears are not only unlikely to go extinct, they are unlikely to notice. Regions where sea levels have been falling are approximately equal to regions where sea levels have been rising. To measure sea level rise, you run into the same problems as detecting global warming. You have to average over the whole world, because the signal in any one area is swamped by various random things, and it is unclear how to do a valid average over the entire world. And similarly, coral bleaching events. There have always been coral bleaching events. Coral grows till it gets too close to the surface, there is an unusually low tide, and the coral dies back, bleaching. I have seen a few coral bleaching events, and it always shallow water coral hit by an abnormally low tide. Similarly, glaciers are always calving, have always been calving, even though each time a big iceberg breaks off a glacier, it is announced as proof of global warming. You may have heard that the North Pole is melting – though no one told you that the South Pole has grown, and is now vastly larger than it was a hundred years ago. This arctic summer, the Northwest passage failed to open. A few days ago, at the time of year when arctic ice is least, an icebreaker cruise ship attempted to force passage, repeatedly ramming very thick ice. The ship broke, the ice did not break. Well, Warmists will say, that is weather, not climate, and they are of course, correct. But the bottom line is that a hundred years ago, the Northwest Passage through the arctic sometimes opened in high summer and sometimes did not, and today the Northwest Passage sometimes opens in high summer, and sometimes does not. Changes in the weather remain enormously larger than changes in the climate, making it very difficult to detect any change in the climate. The climate is always changing. Climate Change is always true. But over the last hundred year or so, it has not changed enough for unaided human senses, or even human senses aided by ordinary and reasonably affordable instruments, to detect. Sometimes the climate does change dramatically, sometimes catastrophically, in a hundred years or so. But not this last hundred years or so. So, why the high drama about global warming? Why the catastrophism? Why the demand for dramatic changes that somehow always result in our power system being looted and damaged? The reason for the high drama is that science, technology, and industrialization was created by white male capitalists, an enormous achievement for which mankind should be eternally grateful. And people who hate whites, hate males, and hate capitalism want to destroy science, technology, and industrialization. Anyone who talks about Global Warming or Climate Change in ways that imply it is an important crusade hates you and intends you harm. Maybe he wants to lower your status. Maybe he wants to exterminate your race. But either way, he is your enemy. Whosoever talks catastrophic global warming hates you and is motivated by desire to harm you. Whites, males, capitalists, and white male capitalists created all the good stuff, so they tend to have most of the good stuff, so people who want to take our stuff hate us. Hate whites, hate males, hate capitalists, and particularly hate white male capitalists. Surface measurements have various major sources of error, which have to be guestimated away in an ad hoc manner. The only data that is arguably good enough to estimate the rather small changes in climate is Australia, Britain, and the US – which on the whole have not been warming as measured by surface instruments. And even for them, the warming estimated from surface instruments is rather similar to various sources of error, that have to be “corrected”. The main contribution to global warming as measured by surface instruments comes from sources where you can get any result you want by rather arbitrarily deciding some data is good enough to include, and some data is not, by cherry picking particular events – for example warm nights indicate America is warming, but hottest days indicates America is cooling. You can always find one indicator to be alarmist about, but on the whole, where our data is good, surface instruments indicate little or no global warming. Because our surface instrument database is noisy, inaccurate, and incomplete, there is plenty of room to spin it any way one pleases. The most precise measurement of global warming comes from satellites, which indicate a warming of one degree centigrade per century. Recent changes in the icecaps indicate slight warming over the last thirty years ago, though the antarctic icecap has increased by almost the same amount as the arctic icecap has decreased, but the icecaps still have substantially more ice than a hundred years ago. The landing sites of early antarctic explorers are now behind a vast barrier of thick, and very old, ice impenetrable to icebreakers. A century ago there was too much open water at the North Pole, even in midwinter, to access it by dog sled, yet today, you can access it by dog sled in winter. Early attempts to reach the North Pole by dog sled had huge problems with open, ice free areas of water. Recent efforts to recreate those trips using identical equipment just took a straight line over solid ice. The worlds biggest glaciers, the ones in the Himalayas are growing. Greenland glaciers are arguably shrinking, but by a miniscule amount. Glaciers do not tell you today’s weather as compared to yesterday, but today’s weather as compared with a very long time ago. Which fits with the experiences of arctic and antarctic explorers a century or so ago. Different glaciers are giving different indications, which is consistent with the conjecture that some years, some decades, and some centuries are warmer, and others are cooler. So, lukewarming is true, for the moment, natural variation is true, and catastrophic warming is not true. Reagan talked about defunding the left, but never actually did anything. As a result of Trump’s threats against Berkeley, they are starting to think that hiring a bunch of thugs to beat people up and cause over a hundred thousand dollars worth of damage may have been a bit excessive. Meanwhile Trump and congress are working on stripping two billion from NASA global warming propaganda. 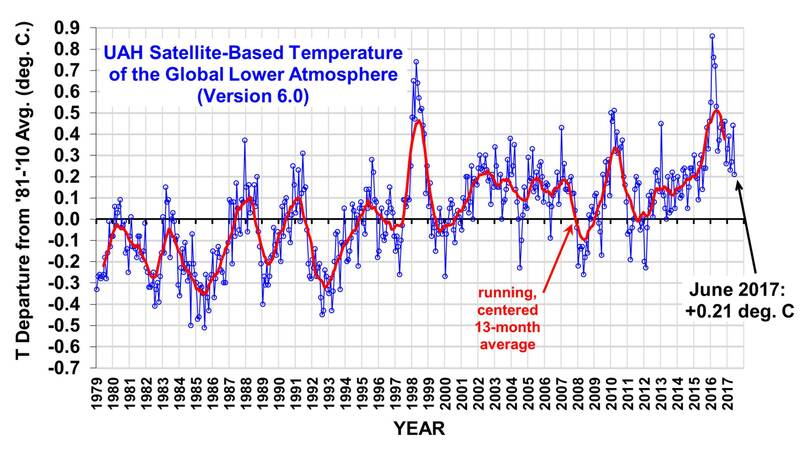 According to NASA’s climate data, GISS, calculated from surface stations, the world is getting hotter primarily in places where there are no surface stations. Of course cutting a few billion from climate change activism is small change compared to the core of the problem, the universities, and I cannot see Trump taking on the universities unless he makes himself King. But two billion less for climate change activism is the first cut for the left since the cuts that happened in restoration of Charles the second. It is a start. Further, it is going to scare the vermin into voiding their bowels, since it was the most blatantly propagandistic warming “science” that got the first cut.